Looking north on Main Street from near the corner of Pynchon Street in Springfield, sometime around 1900-1905. Image courtesy of the James Ward Birchall Collection. 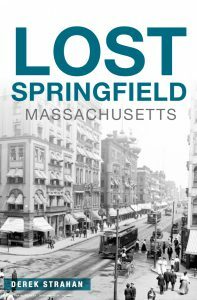 When the first photo was taken in the early 20th century, Springfield was a prosperous, rapidly-growing city, and this section of Main Street was the heart of its downtown shopping district. Major department stores included Forbes & Wallace – whose original building is seen second from the left in the first photo – and W. D. Kinsman, located further in the distance at the corner of Bridge Street. In 1906, a few years after the first photo was taken, these stores would also be joined by another competitor, Steiger’s, which opened its flagship store a couple blocks north of here at the corner of Hillman Street. Along with large department stores, this scene also included smaller, specialized retailers. 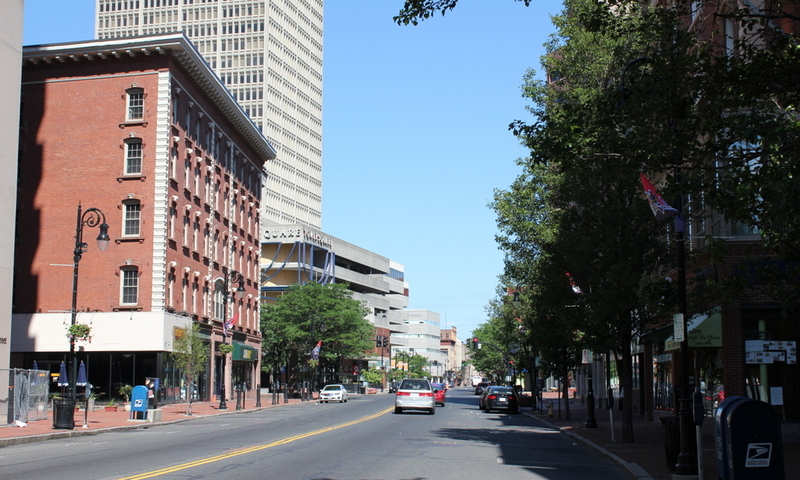 On the far right was D. H. Bingham & Co., a clothing store that had opened here in 1867 in a building previously occupied by the offices of the Springfield Republican. Other early 20th century stores in the foreground included Johnson’s Bookstore, which was located next to D. H. Bingham, and the W. J. Woods Co., another clothing store located further in the distance at the corner of Main Street and Harrison Avenue. The scene also featured several hotels, including most prominently the Haynes Hotel on the left side in the foreground. 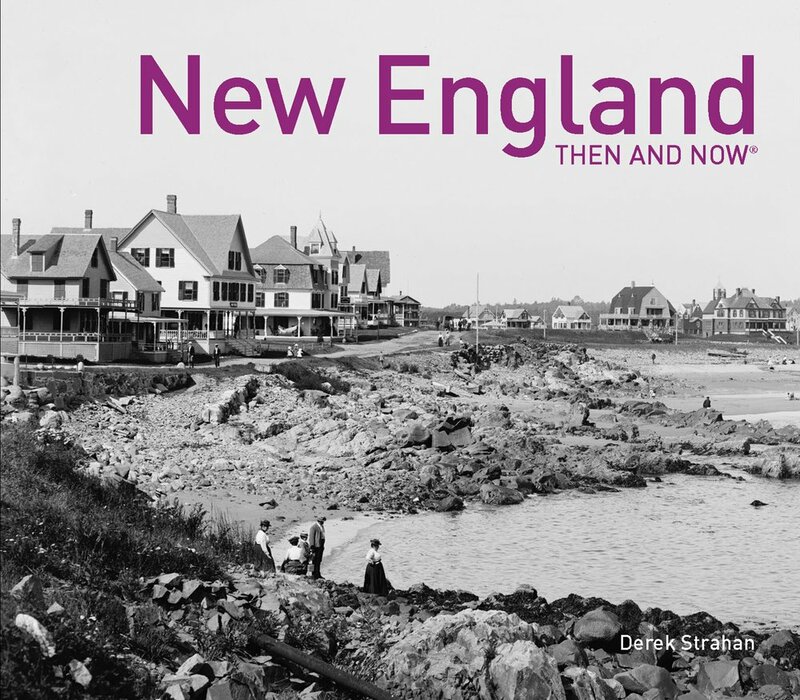 Most of the buildings in the first photo were built in the late 19th century, during a period of rapid growth that saw Springfield’s population double roughly every 20 years. 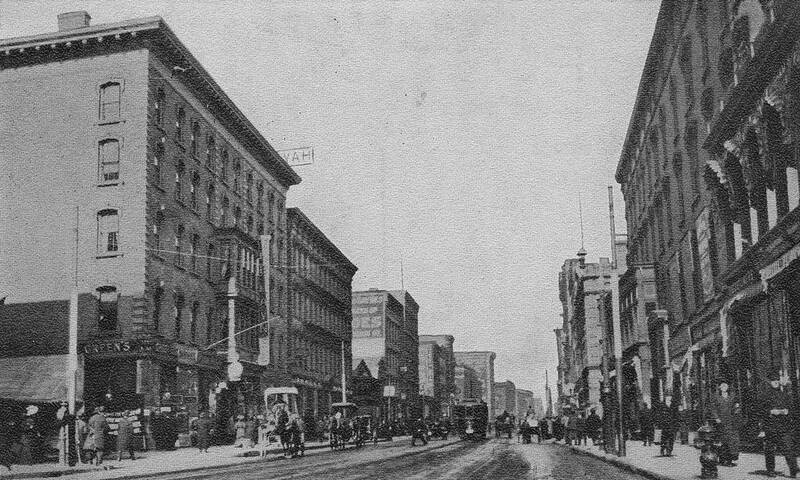 However, very few of the buildings along this section of Main Street are still standing today, aside from the Haynes Hotel on the left and several of the buildings on the right in the foreground. The old Forbes & Wallace building is gone, along with its early 20th century replacement, and today Monarch Place occupies the site. Further in the distance, the Tower Square skyscraper now fills the entire block between Boland Way and Bridge Street, and there are no other 19th century buildings on the left side until the Fort Block, which is barely visible more than four blocks away, in the distant center of the photo.